By LUDWIG VON KOOPA - It's a special demo... it's not a test! 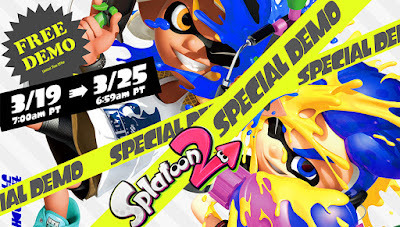 Right now until the 25th of March, Nintendo is offering an incredible and free offer that you can convert into a purchase-worthy discount: Splatoon 2 has a free, non-barebones demo of Turf War, Ranked Match, and the most important mode of all, Salmon Run. If you don't have Nintendo Switch Online, it comes with its own 7-day trial of it—independent of the already-existing 7–9-day free trial of Nintendo Switch Online. Why is Nintendo offering this? The game is better than the official promotional art implies. If you hear a Booyah!, please return the Booyah! Enjoy Splatoon 2 for free while you can! (And if you really like it, you can buy it for 20% off during the week the demo is available.) I'll be trying to get anti-Splatoon grouch RawkHawk2010 to give Salmon Run a try after he disliked the Turf War-only Splatoon 2 Global Testfire so much. While you shouldn't expect much in the way of more updates to Splatoon 2 if you're just now buying it, the game already has more than $60 worth of content. Certainly more than $48. And it's even better if you use the savings to also buy the Octo Expansion! Ludwig hasn't actually downloaded the demo for the purposes of confirming assumptions made in this article, since he already owns the full game and administers the KoopaTV Family Group for Nintendo Switch Online. Splatoon 2 already has a history of substantial demos, like the demo Splatfest they did. I downloaded the demo, despite already having the actual game and I still got the code for the NSO trial, great for when I have a gap between my current time in the family plan I am in and if KoopaTV is planning another Family Plan placement as a prize. The fine print on Nintendo's press release implies the NSO time duration is between whenever you activate it and Monday March 25th in the morning. If you can activate it whenever you want for 7 days, let me know. Good catch. This is what happens one one does not get any sleep because of THE BABY. Fine print becomes a mishmash. We're all about helping people understand the fine print! Thanks. I am already acting more and more like a senior citizen each day with not picking up on fine print or scams. Last week I was given a wrong number and gave too much personal information which led to me signing up for insurance I did not need. It was a telemarketer number that worked for another company so it took a long time to find the insurance company which was at least legit and I managed to cancel it and I had to change my credit card number as an extra measure. Basically we searched high and low for the right number. Then of course the number was dialed wrong and we reached a telemarketer by mistake without realizing and the telemarketer changed tactics on the fly and pretended to be for the insurance company we wanted. That telemarketer sounds incredibly talented.